Go Cheap, Go Small, Go NOW...and LEARN with a Small RV! 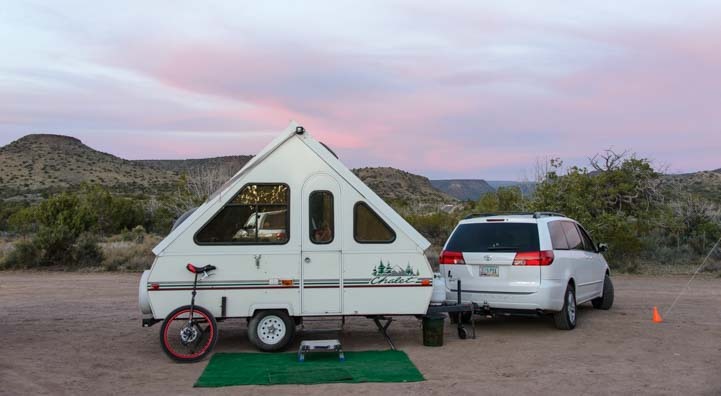 A few weeks ago we camped in Sedona, Arizona, with two good friends who own popup campers. We were reminded how much fun these little trailers can be and how much we learned in the two years we owned ours before we started RVing full-time in our first big trailer. 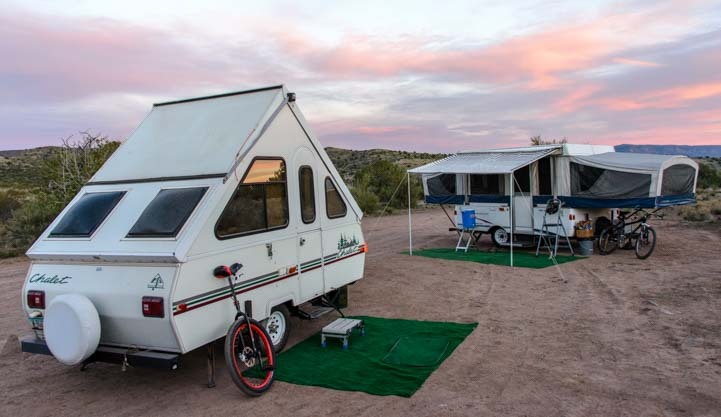 If you are thinking about RVing full-time sometime down the road, a year or more from now, the most valuable thing you can do in the meantime is buy a little rig and go play. There is no better way to learn about RVing than to go out and do it, and a small RV provides an awesome introduction. You can trade in the little rig for a bigger one when you are ready to take the plunge and go full-time. We camped in our fifth wheel with good friends who have two different styles of popup campers. We owned our popup for two years and spent every possible weekend and vacation in it before we started full-timing. We towed it all over the place. It was routine for us to travel 300 miles with it for a long weekend or to tow it 1,500 miles on a week’s vacation. A popup tent trailer folds up small and opens up to be a nice sized rig with beds on each end. Before we even knew what full-time RVing was, we had already learned a lot about the RV lifestyle from camping in our popup. We dry camped in it most of the time, so we learned little things like exactly how much water we typically used in a day, and how to take a one gallon shower. We made all kinds of classic rookie mistakes as we tried to keep our battery charged, and we figured out how to “live small” and cook in a dollhouse sized kitchen. 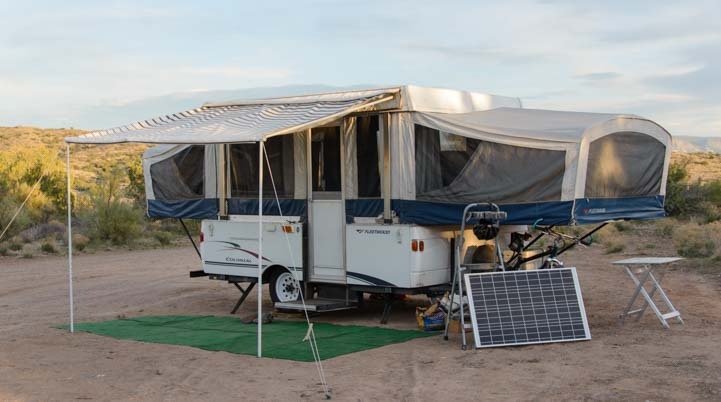 The surprising thing is that our popup camper had many of the same basic systems as our current fifth wheel trailer that we now live in year round. It had DC lights, a propane RV fridge, 26 gallons of water, including a 6 gallon propane hot water heater, a water pump and a propane furnace. It had a shower and a two burner propane stove, and it could hook up to shore power for electricity and to a city water connection for water. It even had one thing our current RV doesn’t have: a king size bed! It also didn’t have an air conditioner. We knew we’d be camping in places where we wouldn’t need one, so why pay for something we wouldn’t need?! A popup trailer is small and easy to tow and fits in the garage! The fun thing about running around in a little RV is that you can can go almost anywhere the Big Rigs go and get a taste of living a nomadic lifestyle without spending a fortune. We took our popup camper to some wonderful RV parks and hooked up to electricity and water just like the big fifth wheels and motorhomes. We stayed in RV parks in San Diego (right on the water – wow! ), and the Bay Area in California (in a cool wooded area not too far from the city), in the Moab Utah area where we bicycled in the red rocks, and in New Mexico, where we bicycled in the mountains. Camping in these RV parks gave us a chance to wander around the loops and meet people that were experienced RVers. We’d talk with them about their rig, find out what they liked and didn’t like about it, and we’d get their advice for what to look for if we ever wanted a bigger RV (we had NO idea we ever would!) and we’d get suggestions for where to travel with our little popup. We learned about full-timing, and we learned about work camping, and we discovered a world we’d never known anything about. We supplemented that education with online research and magazine subscriptions, but there is no better way to understand an RV’s systems than to use them, and no better way to understand the RV lifestyle than to live it. This is a Chalet A-frame, and it has a twin bed, a dinette that folds into a full size bed and kitchen. The beauty of an A-frame is it’s light enough to be towed easily by a minivan. Lots of people email me expressing interest in going full-time and some express interest in boondocking too. These are big steps, and having as much first-hand experience as possible before you jump in is a really good idea. Online resources are great, but they are limited and only go so far. 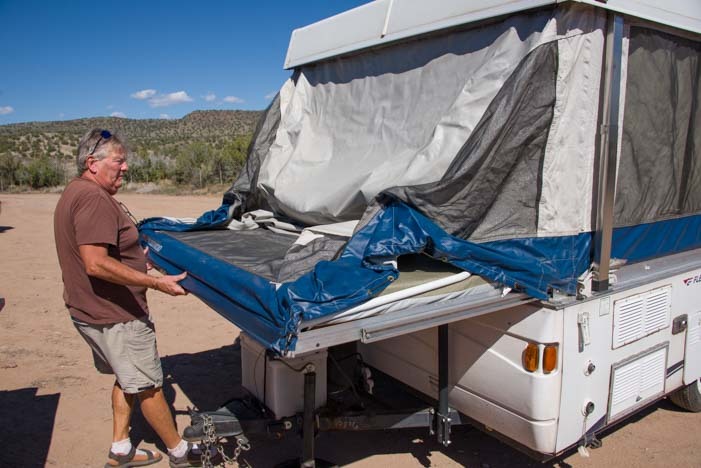 If you haven’t done much tent camping, and you dream of camping in the wild, learning how to dry camp in a cheap, small, rolling box is a wonderful way to start. It’s a lot of fun, and it will teach you what to look for when you buy a bigger rig, and more importantly, it will help you decide if it’s something you enjoy before you make a big commitment and turn your life upside down. Boondocking is basically glorified tent camping in a fancy rolling box. If you are interested in solar power, you can learn all about it for just a few hundred dollars with a folding solar panel kit and an inverter. The batteries on a popup are right there on the trailer tongue. So, it’s easy to see what’s going on! Before you go full-time, you can sell the solar panel the kit, either with the little trailer or without! 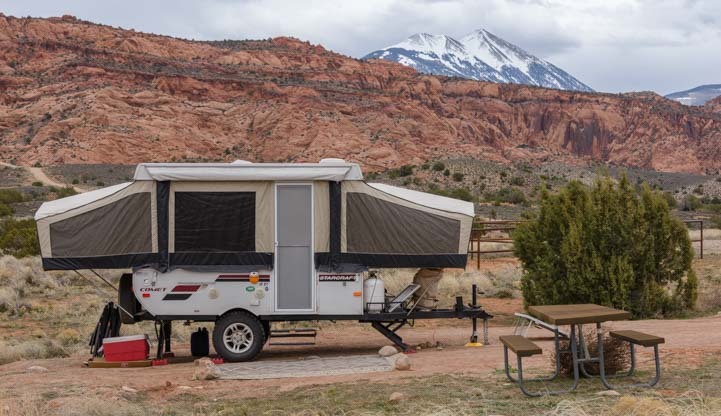 Here’s a pretty campsite in Utah’s red rocks. The transition to full-time RVing is a lot less stressful if you are an experienced RVer already. It’s not a requirement, and plenty of people jump right into living in an RV without ever having used one before, but I think that having hands-on experience is the best way to go. The wonderful thing about getting a little “starter” RV and playing with it for a while before going full-time — besides all the fun you’ll have — is that the mistakes you make don’t cost much, and you haven’t got a lot at risk. If you don’t like it, you can sell it. If you DO like it but have some unexpected repairs, they won’t break the bank and you won’t be trying to live in it while it’s being fixed. 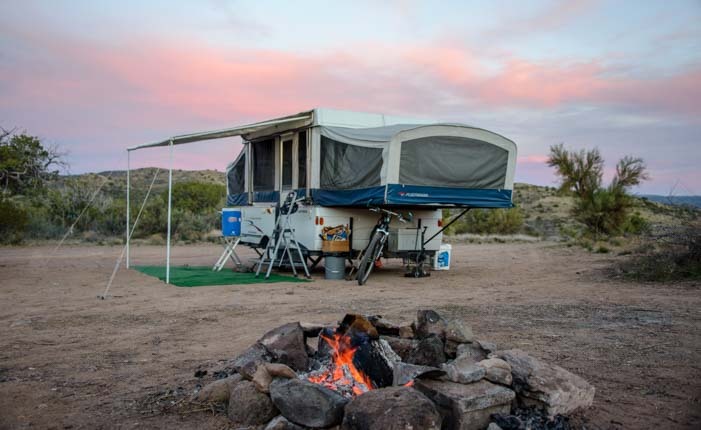 Best of all, you can go home after every excursion and take a long hot shower, wash your clothes in your own washing machine, and you can savor your photos and your memories in the comfort of your big living room, all things that will no longer be possible once you commit to the RV lifestyle full-time. Another great thing about a little RV is that if you have a small budget you can use it to live your full-time travel dreams. A few weeks ago we camped next to a couple in their early 40’s who are a river rafting and white water kayaking guide (him) and a mountain biking guide (her). They live in a 17′ travel trailer, and they absolutely love it. They boondock full-time with the seasons as their jobs move between Colorado and Arizona. The trailer is a huge upgrade for them. They lived in a tent for a few years until this past October when they bought the trailer. A river rafting guide and mountain biking guide love living in this 17′ travel trailer. We’ve known a lot of 40-somethings over the years who lived in much fancier digs, with granite counter tops and sleek cars in the driveway. But they weren’t happy with their lives. It was enlightening and motivating and inspiring to spend time with these two people who had decided fifteen-plus years ago, right out of college, that they wanted to spend their days doing what they loved, even if it meant having a very simple home. We’ve also met people living in a popup tent trailer and a half-ton pickup camper. So, for those who think a nomadic lifestyle is out of reach financially, it just depends on how you want to live. Our friends Rich and Mary bought our popup camper from us when we went full-time nearly nine years ago. While Rich was setting up camp, he let me take pics of the process so I could show you just how easy it is to set up a popup tent camper. First you crank it up with a cranking tool that comes with the trailer. First, crank up the roof all the way. The roof is fully raised but the bed slides are still inside the trailer. Then you pull out the bed slides on either side. Each slide locks into place in the open position. Pull out the bed slide at each end. In many models one or both beds is a King. Then you put the support struts in place. While traveling, these are latched under the bed sllides. Once the bed slide is opened, just hook the end onto a latch on the frame. Attach the supports for the bed slide. The bed slide is in place but the canvas tent isn’t propped up yet. Then go inside and remove anything that’s hogging up space. 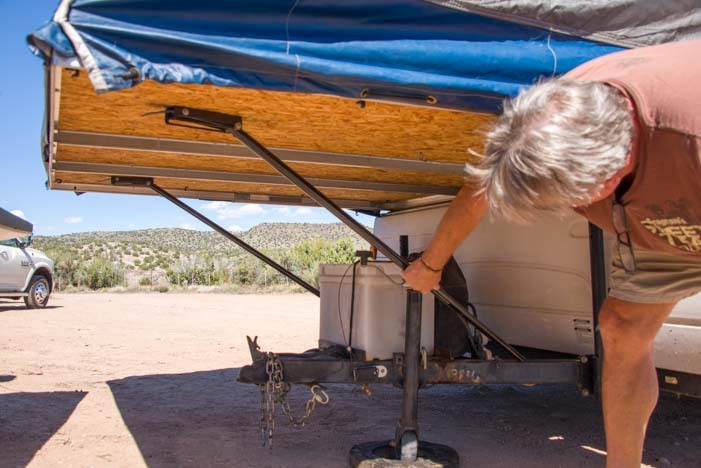 Rich stores his solar panel inside while traveling, so he takes it out at this point. 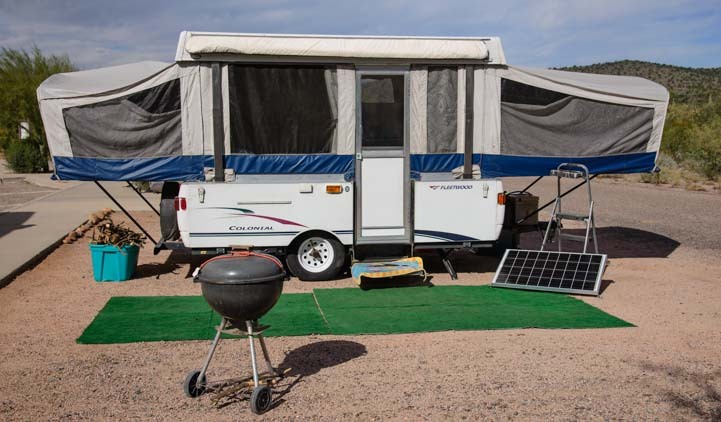 Bring out whatever is stored inside: solar panel, camp chairs, patio mat, etc. 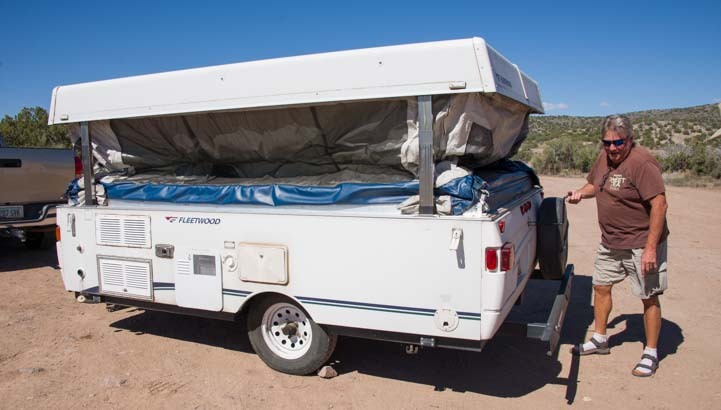 This popup camper — a 2005 Fleetwood Colonial — has a slick lower half door that folds down to become the entrance step. There are lots of designs out there, but this is common in the old Fleetwood lineup. Fold down the entry step. Now remove the door from its travel spot where it is suspended from the ceiling and put it in place using the velcro strips on either side. The door and its frame are one unit, so the hinging is solid, but it stands upright in place using latches and velcro. Lower the door from the ceiling and press it into place along the velcro strip on the canvas. Now open up the canvas above each bed. There is a special support rod that hooks in place that holds up the center of the canvas roof over the bed and gives it its shape. You can hang things from the loop – a lantern, fruit basket, whatever. The canvas over the bed slide is fully opened. Now crank down the landing jacks. 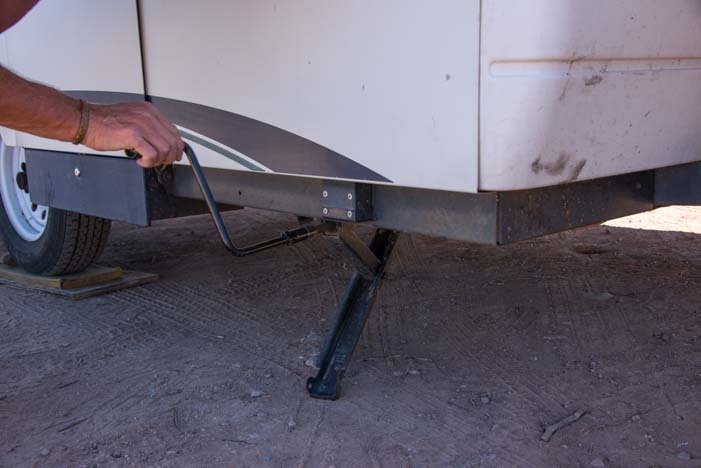 These give the camper floor a bit of rigidity as you move around inside. The interior isn’t huge — it’s just a 10′ by 8′ box or so — but you can walk around. Having the landing legs down keeps the floor solid. Last of all, set up the gray tank. This is a bucket outside the back of the trailer! If you want to see exactly how much water you use to wash dishes, there it is! 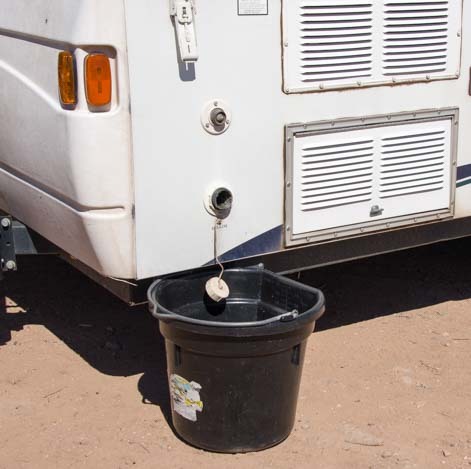 Set up the gray water tank (this popup camper doesn’t have a toilet). The shower is a shower wand on the back of the popup camper. We just wore bathing suits and stood on interlocking rubber mats. If you are more modest than that, you can set up a shower enclosure. We didn’t have any kind of solar gear when we owned our popup. We used a battery charger in our garage to charge the batteries before we’d go on a trip, and that was it. We learned really quickly how to be conservative with electricity. Rich decided to install a second battery on the trailer tongue. He also bought a solar panel and had it wired so it could be connected to the batteries easily. 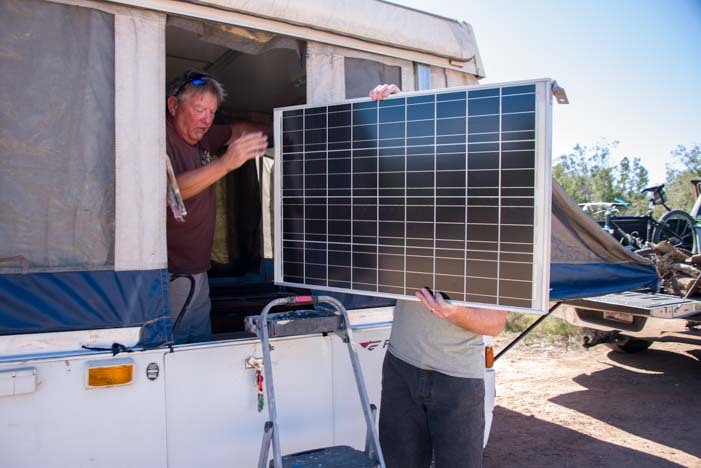 Another super easy alternative is to get one of the portable suitcase solar panel kits that is designed for RV use. You can also run heavy gauge wire from the batteries to an 800 or 1,000 watt inverter located inside the popup and then run a power strip from the inverter to a handy place in the rig so you can charge your phone or laptop or run a small appliance. Put out the patio mat, raise the awning and set up the solar panel. Done! If you are looking forward to having big RV adventures on the road someday in the future, make that “someday” be today! Go out and get a cool little RV and have a blast. Popup tent trailers like ours are a little heavier (the GVWR is 3,000 lbs. ), so both we and Rich bought Toyota Tundra pickups to tow it. An A-frame popup is lighter, because there are no bed slides, so our friend Mark tows his with a minivan. 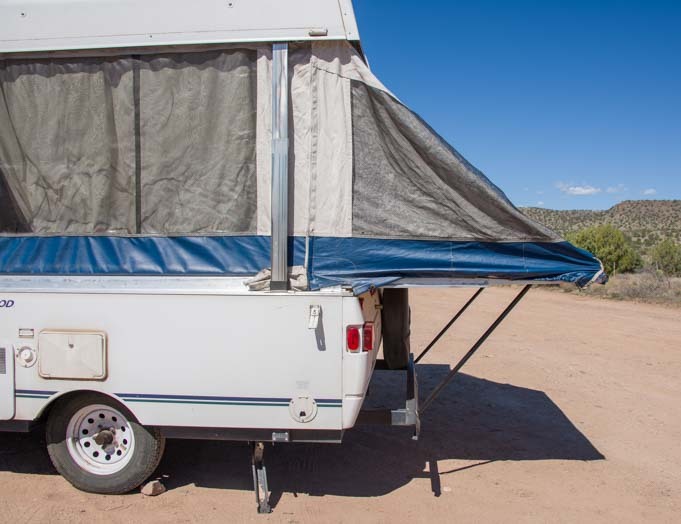 More info and links for specific popup camper manufacturers below. How Big an RV Do You Need? – Sometimes Less is More! Hey Guys , I have been following for a good while now , thanks for the wonderful photo and great informative info. 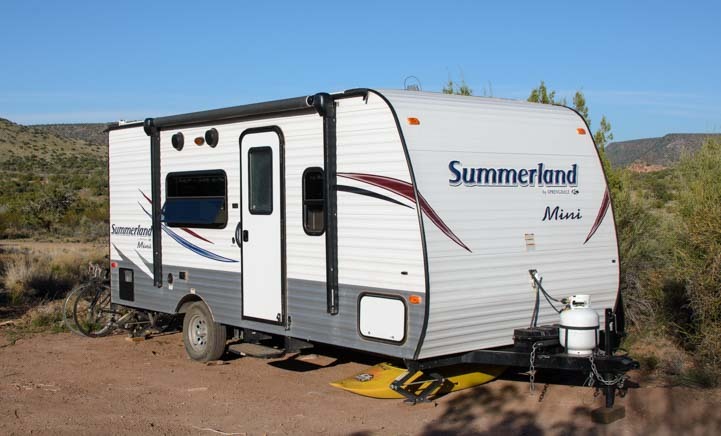 I am a 67yr widowed guy am selling my house and looking for a travel trailer for full time, but all the customer reviews on the trailers I like are terrible, I’am interested in something like that summerland mini or rockwood mini or skyline , I’am looking for a used 16-20footer , not cold weather , would you have any comments about this type an why all the reviews are bad. Thank you so much and keep up the good work (play). As with anything on the internet, you have to consider the source, especially when it comes to reviews. When you see a slew of rave reviews, were they posted by manufacturer? When you see a bunch of bad reviews, were they posted by a competitor? The pay-per-review industry is alive and well. Your best bet is to rely on your own gut instincts when you see the rig with your own two eyes. Does it look well made? Does the design make sense? 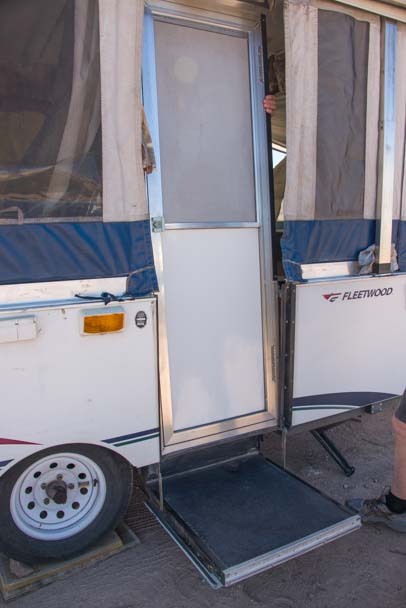 We loved our Fleetwood Lynx trailer, yet Fleetwood had a poor reputation. I live and travel full-time in a 12′ ALiner Sport, which is 3′ shorter than the A-frame camper you show! I love that I can get it into very small campsites, and it takes less than a minute to get it set up and get in the dry if it’s raining. How wonderful, Janis!! We often wish we had a little rig that could tuck into small places like yours can. Good for you, and have fun out there!!! Not to be a Negative Nellie, but I would highly suggest a *used* pop-up trailer if one is going to try this. There isn’t anything easier to buy than a new RV but they depreciate faster than a falling rock! Our friend bought a new one — used it once or twice — and was finally able to sell it for what he owed on it. (I doubt he would have ever been able to set it up OR take it down by himself. He was completely impressed how quickly we could hook up to our fifth wheel and be ready to roll.) If they buy a used one (from an owner; not a dealer!) — after shopping around a bit — they can use it for a year or two and get all or most of their money back. We’ve been living seriously offgrid on a shoestring for 5 months so far and our single 420 watt PV panel (MPPT charge controller with four RV/Marine batteries) absolutely transformed our boondocking experience. We live as if we are plugged in 24/7 but we almost never are. Even back here at ‘home’ where we could plug in, there’s no need to. And we do it all with a 300 watt Power Up! inverter. I did run a cord out once for Annie’s blow dryer and two other times to run the vacuum cleaner but that’s it! New versus used and style of trailer is all a matter personal preference and budget. When we fell in love with our popup at the dealership, we fell so hard we forgot to negotiate and paid full MSRP!! We sold it two years later for 45% of what we paid for it. Did we mind the “loss”?? Are you kidding?? It was the best education we ever could have asked for, and it opened our eyes to a new lifestyle that has ultimately transformed our lives. Sounds like you have a great solar power setup on your fiver! 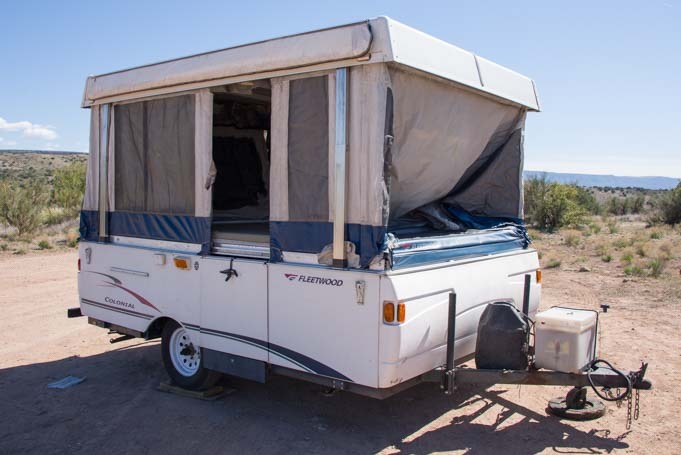 It’s similar in size to ours (more info here) which has served us well for over 2,000 nights of boondocking. We have plugged in just a handful of times since we started full-timing in 2007, and only once since 2008. It’s a beautiful life!! Thanks for great post as always and great suggestion! I share with many of my friends your blog! It’s a lot more fun to run off in a little camper and have some real adventures than to sit at home dreaming about “someday.” I’m glad you like the suggestion. And thank you so much for sharing our blog with your friends. Happy trails!! We are feeding our desire to RV with our Craigslist Pop-Up while we wait for the time to be right to embark on our full-time adventure. We are learning much about RVing in the process as this is a whole new world to the both of us. We feel we are earning our “street cred” in the Pop-Up. 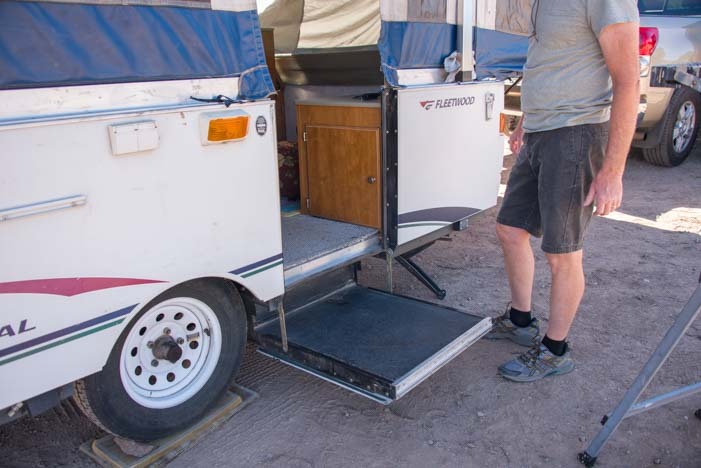 The mistakes we make in our cheap trainer camper will save us hassle and expense down the road. I appreciate the opportunity to see how I fit in (physically and socially) at a campground without the stress of being a novice pulling in with a huge fifth wheel to a campground for the first time. Thank you for your post…it succinctly said what we are experiencing. You’re welcome, Sandi. That is exactly how it was for us too. Another great thing about popups is that they can give anyone a bit of freedom, not just newbies. 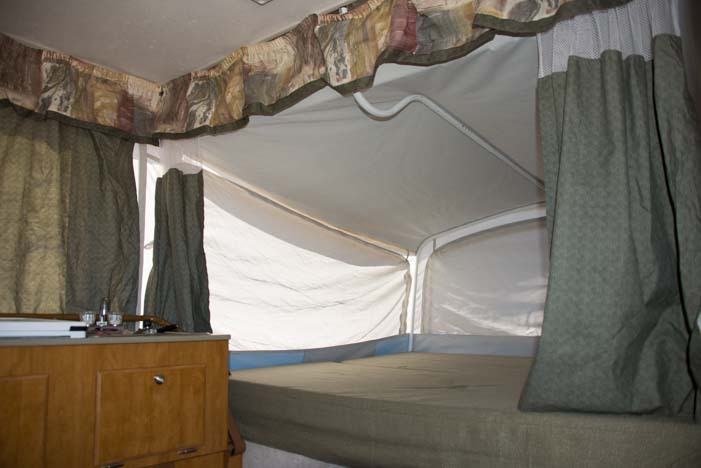 Popups and pickup campers are fabulous for experienced folks who are winding down from a lifetime of RVing. We met an older fellow and his wife in a popup who said they had run the whole gamut: tent, popup, travel trailer, fifth wheel, Class A — and now were back to a popup in their golden years. 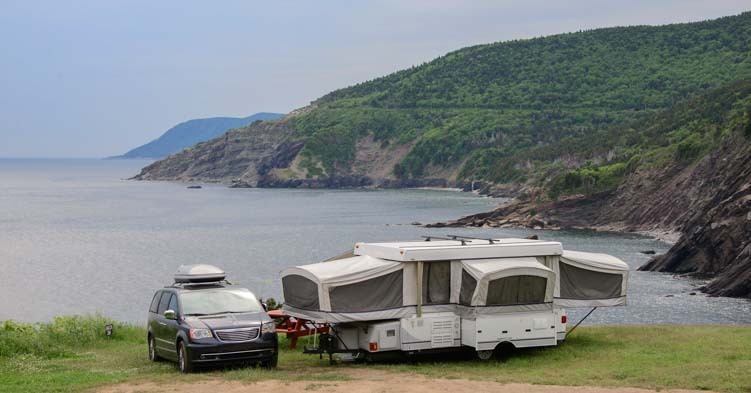 Our RVing mentors who were RV snowbirds in a big fifth wheel for 30 years now run around in a truck camper on summer vacations as they head into their mid-80’s. Have fun with your little rig. We’ll undoubtedly be back in one too someday!!! My husband and I are in the planning stage of selling our home and belongings and going full time in what ever our new rv will look like. The process is daunting however your site is invaluable for information and has become my go to place each morning. One thing I have not found any discussion on is security while travelling/living full time. We plan on boon docking most of the time and wonder if you have any thoughts, tips or suggestions about leaving your rig in the middle of ‘nowhere’ and going off for the entire day. We also think about safety during the night, are you a target parked out in the middle of nowhere with a rig and truck and all your equipment. 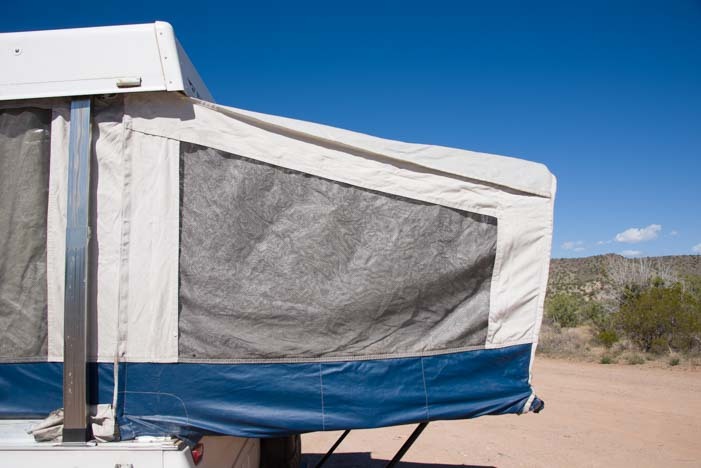 Perhaps being city dwellers with only seasonal RV experience in RV parks is a bit like leaving that web of security but we want to be prepared in the best way we can. I would appreciate your opinions and any tips that you could share. Thank you so much. Thank you for your enthusiasm, Sharon. There isn’t anywhere reachable by RV in America that is actually “the middle of nowhere.” Anywhere that is accessible by a big ol’ RV is always somewhere that there not only are locals, but often there are rangers, cops, and usually there are other travelers too. As city dwellers, I’m sure you have a good sixth sense about safety, and you can simply rely on it to determine how safe an area feels. 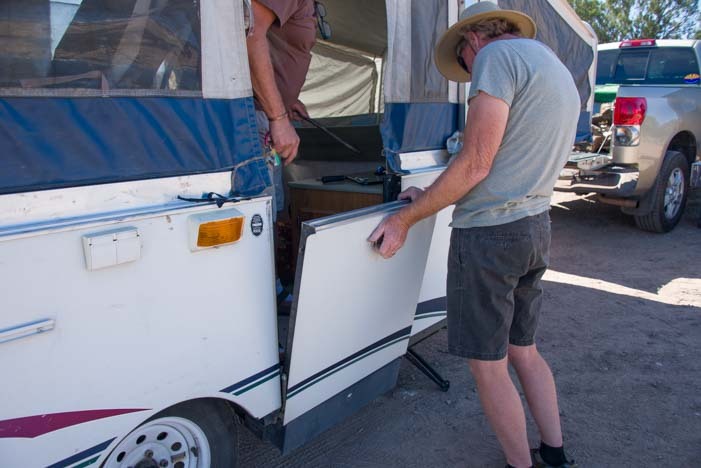 I talk in more detail about these issues at this link on our page about boondocking. Thank you for reading our blog every morning. I hope it continues to inspire you!